Who doesn't love a good fat burrito or a yummy quesadilla now and then? I certainly do! I am extremely guilty of grabbing one on the go at my favorite fast-food joint. The problem with eating fast foods of course, is that you do not really know what is in the food you are devouring. I am sure they are filled with ingredients that just aren't very good for our bodies. That is pretty scary, isn't it? I was pretty excited when I got the chance to review Red's All Natural burritos and quesadillas. 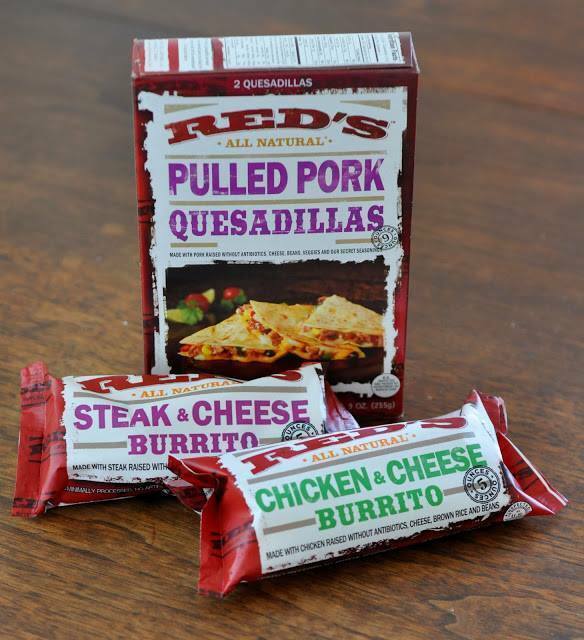 Red’s All Natural burritos and quesadillas are clean, wholesome and delicious! All Red’s products are 100% all-natural, non-GMO, preservative-free and made with antibiotic and hormone-free meat and rBGH-free cheese. Red’s also only uses authentic tortillas made from the simplest ingredients. They are just big enough to hold together all the goodness inside without overwhelming the delicate burrito balance. My Experience: I was sent coupons to redeem for a few of Red's All Natural products, so off I went to Target to the frozen food aisle. I selected Red's Chicken Teriyaki Burritos, Steak and Cheese Burritos, Pulled Pork Quesadillas, Steak Quesadillas, They are so easy to heat up and enjoy. I simply microwave my burritos for 3 -4 minutes. To heat up the quesadillas to 'perfection' I thaw them in the microwave for a minute and crisp them up in a pan on the stove top. So good with sour cream and salsa! Red's All Natural burritos and quesadillas are the absolute best I have ever tried. I will definitely be stocking up on them for my family to enjoy at home. They taste much better than the drive-thru variety and do not have anything but natural ingredients. What more could I ask for? Disclaimer: I received coupons to redeem for review of these products. ALl opinions are my own.